Cornelius J. Houghton married Mary Emery in Apr 22, 1866. Seavey M. Houghton married Emma Clemens in circa 1885 mar 15 years in 1900 census; mar 24 y in 1910 census. Corilla Hall Houghton married William Streeter. William Streeter married Corilla Hall Houghton, daughter of Abner Houghton and Susannah Taylor. James Cornelius Houghton married Emily Frances Kimball in Mar 26, 1851 at Littleton, Middlesex Co., MA, USA, JWH, MLM: 26 Mar 1857. James Cornelius Houghton married Sarah Elizabeth Hayward in Jan 21, 1863 at Ashby, Middlesex Co., MA, USA, he, a. 37 y; she, 28 y; MLM: Jan. 2, 1868. 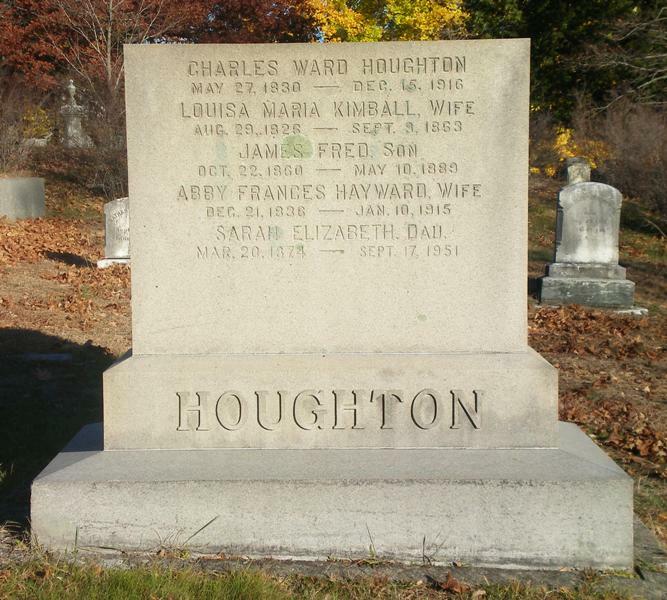 Charles Ward Houghton married Louisa Maria Kimball in Apr 10, 1856 at Littleton, Middlesex Co., MA, USA. Charles Ward Houghton married Abby Frances Hayward in Sep 22, 1864 at Ashby, Middlesex Co., MA, USA. Louisa Maria Kimball married Charles Ward Houghton, son of Joel Houghton and Mary Stone, in Apr 10, 1856 at Littleton, Middlesex Co., MA, USA. 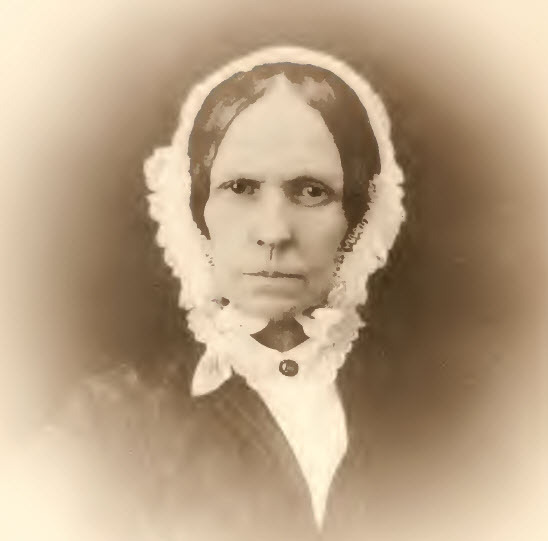 Emily Frances Kimball married James Cornelius Houghton, son of Joel Houghton and Mary Stone, in Mar 26, 1851 at Littleton, Middlesex Co., MA, USA, JWH, MLM: 26 Mar 1857. Sarah Elizabeth Hayward married James Cornelius Houghton, son of Joel Houghton and Mary Stone, in Jan 21, 1863 at Ashby, Middlesex Co., MA, USA, he, a. 37 y; she, 28 y; MLM: Jan. 2, 1868. Abby Frances Hayward married Charles Ward Houghton, son of Joel Houghton and Mary Stone, in Sep 22, 1864 at Ashby, Middlesex Co., MA, USA. Albert Smith Rockwood married Josephine Clark in Nov 27, 1851 at Palmer, MA, USA. Josephine Clark married Albert Smith Rockwood, son of Samuel Rockwood and Anna Houghton, in Nov 27, 1851 at Palmer, MA, USA. Clark Houghton and Fanny Smith declared their intentions of marriage on Apr 29, 1814 Deerfield, MA, USA. Clark Houghton married Fanny Smith in May 10, 1814 at Deerfield, Franklin Co., MA, USA. Lucretia Houghton married Hon. Samuel Prentiss in Oct 3, 1804 at Nortfield, VT, USA, at father's home; CT Nutmeggers: Northfield, MA; Northfield Hx: Montpelier VT.
Harriet Houghton married Abel Bellows in Dec 22, 1817 at Walpole, NH, USA, MLM: Winchester NH. Esther Smith Houghton married Charles Bowen in Jun 15, 1813 at Tarrytown, NY, USA, Northfield VR. Fanny Smith and Clark Houghton declared their intentions of marriage on Apr 29, 1814 Deerfield, MA, USA. Fanny Smith married Clark Houghton, son of Edward Houghton and Sarah Smith, in May 10, 1814 at Deerfield, Franklin Co., MA, USA. Notable Hon. 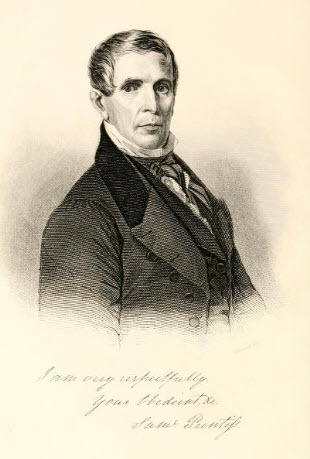 Samuel Prentiss (1782-1857), husband of Lucretia Houghton, was a U.S. Senator from VT, 1831-1842 and a Supreme Court Judge of VT.
Hon. Samuel Prentiss married Lucretia Houghton, daughter of Edward Houghton and Sarah Smith, in Oct 3, 1804 at Nortfield, VT, USA, at father's home; CT Nutmeggers: Northfield, MA; Northfield Hx: Montpelier VT.
Abel Bellows married Harriet Houghton, daughter of Edward Houghton and Sarah Smith, in Dec 22, 1817 at Walpole, NH, USA, MLM: Winchester NH.